Vacuum fluctuations may be thought of as a flickering of the quantum light field even in total darkness. The positive (red) and negative (blue) regions are randomly distributed in space and they change constantly at high speed – similar to black-and-white noise on a TV screen with no signal input. (Phys.org)—A team of researchers working at the University of Konstanz, in Germany is claiming to have directly sampled electric-field vacuum fluctuations, which would be the first ever made. In their paper published in the journal Science, the team describes an experiment they carried out and a part of it which they claim indicates that they have measured vacuum fluctuations directly for the first time. Theoretical physicists believe that empty space is not empty at all, instead it is filled with quantum particles that pop in and out of existence creating what are known as electric-field vacuum fluctuations. Prior research has led to efforts that have measured such fluctuations indirectly, but no one, until now, has claimed to be able to measure them directly. The experiment conducted by the team in Germany involved using a long pulse of light to study a shorter pulse of light by firing both through a crystal at the same time. The long pulse had a horizontal polarization while the shorter pulse had a vertical polarization. In such an arrangement, properties of the crystal are dependent on the electric field that exists inside of it, which in turn causes a change in the polarization of the beams that are fired into it and then emerge on the other side. The researchers adjusted the timing of the light pulses to map out fluctuations in the electric field. To offset vacuum fluctuations related to their own existence, they put in just the probe pulse—nothing else. When repeated many times, the researchers found the polarization varied slightly, which the researchers attributed to vacuum fluctuations. To be able to actually see what was going on, the team varied the width and duration of the pulses but not the number of photons in a given beam. They noted that the shot noise should have stayed constant as the pulse grew in size, but it did not, which the team claims was due to electric-field vacuum fluctuations. Not everyone is convinced—many in the field on reading the paper by the team were quick to point out that variations in the pulse could just as easily have come from something else. Clearly more work will have to be done before the claims made by the team are accepted by the physics community. The ground state of quantum systems is characterized by zero-point motion. Those vacuum fluctuations are generally deemed an elusive phenomenon that manifests itself only indirectly. Here, we report direct detection of the vacuum fluctuations of electromagnetic radiation in free space. The ground-state electric field variance is found to be inversely proportional to the four-dimensional space-time volume sampled electro-optically with tightly focused few-femtosecond laser pulses. Sub-cycle temporal readout and nonlinear coupling far from resonance provide signals from purely virtual photons without amplification. Our findings enable an extreme time-domain approach to quantum physics with nondestructive access to the quantum state of light. 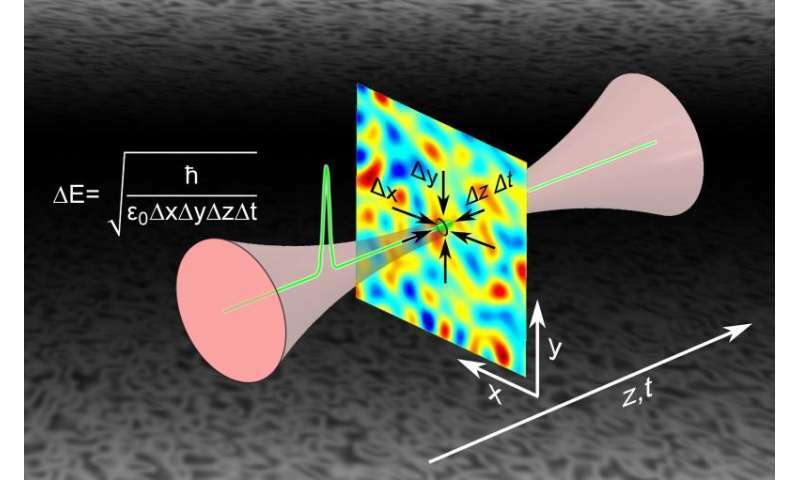 Operating at multi-terahertz frequencies, such techniques might also allow time-resolved studies of intrinsic fluctuations of elementary excitations in condensed matter. It is obvious that cosmic vacuum in not emptiness but real physical medium with certain physical properties. Emptiness can not transmitting electromagnetic radiation. The structure of vacuum of space controls the behavior of elementary particles in different zones of space and can be reprogrammed by the will of the Creator. This is the divine matrix. This explain why the behavior of cosmic structures in different regions of space diverges from the predictions made with the help of accepted by the scientific communities theories. "This is the divine matrix." We will get every kind of supposition in this thread. If we could predict and sort these fluctuations you might be able to make free energy. Like the Penrose process for black holes only locally. As an engineer I guess I should submit to the carnot limit, but I'll hold out for relative entropy. It's sounds like a mishmosh of optimism or the insanity of the reversal extremes, but then again there are wilder claims. "Divine matrix" sounds to me like someone who has faith that should be channeled into doing the actual math or picking up some representation of Plato to read. I recommend Gorgias. Pluralism, singular Being, and Nihilism all have there appeal. After that get some Karl Popper. A life lived without the extremes still has value as reason are not ends in and of themselves. The tradition of science is to seek falsifiable claims in an experimental context, not to label holisms of truth. How can we name the belief in imaginary objects which are mathematical artifacts from the unsubstantiated theories like GR that do not rely on facts but on speculative spirit and which have no confirmation in reality? Ignorance or wishful thinking? Do you think that the structure of cosmic vacuum will allow such meaningless singularities in the physical environment? Whether gravitational permeability of this structure is not restricted like the electromagnetic permeability as well? Think about it. Do we now deem ourselves to be sufficiently intelligent to get something from nothing? Roman empire, started 27 BC. Babylon, founded 1894 BC. I'll assume your mistake is due to your limited grasp of English. However, blaming a democratic voting system on an empire is just plain stupid. Naw its based on the ease with which religionists rewrite history. Comes from their total disregard for evidence. So youre really a dense aether guy? Just another religion based entirely on faith. Zorry Zephyr I heard all you had to say years ago. All poetry no substance, over and over again. Youve been turned off for months. Docile, how does someone who has "turned you off" read what you post? Comic is the tenacity with which anonymous voters try to influence public opinion not by scientific arguments but with the help of the vote system in the website. Maybe because we live in a revived Roman empire, which was ancestor of the ancient pagan Babylon, this system is so popular today even where there should not be - in sites pretending to be scientific. Vote system in such sites makes them a mass culture tribune. Crediting the mystical machinations of magical beings for observed physical phenomena is a good way to screw up a fun discussion of cutting-edge research. This is why the faithful do not get to play with the the most expensive toys. Fairies are a waste of time and money. My mistake. The meaning of the post remains. Evidence for evolution? When? Where? Give just one evidence. Nothing more. What is the probability at introducing random changes in a complex structurally and functionally organized physical system, it to acquire new functionality compatible with the old functionality and its managing and synchronizing mechanisms? And what is probability to lose some of the existing functionality with random changes? If the probability random changes to damage the existing functionality of the cell is much greater than the probability to emerge new functionality compatible with the existing functionality, when in the beginig according to the theory of evolution there was very little functionality in the first living organisms, can we expect billions of years of evolution? Think about it without emotions. Many people do not believe in lies and this is most natural state of human mind. Such people believe in facts but not in philosophical theories not connected with reality. All things than build our physical reality obey Gods laws and principles. Did not pop up from the nowhere and nothingness without idea and purpose. Human theories as vain and useless because they very often are based on wishful thinking and we have no access to fundamental processes of nature. What we can see is a very small part of the true picture. Because the visible is for the man and invisible is for the God. The rest is human vanity fed with traditional speculation. "Crediting the mystical machinations of magical beings for observed physical phenomena is a good way to screw up a fun discussion of cutting-edge research. This is why the faithful do not get to play with the the most expensive toys. Fairies are a waste of time and money." Mystical delusions are the believe that highly ordered universe with precise tuned physical laws and constants emerged without reason and purpose from nowhere. Rules emerged without the intervention of an intelligent being? Haw can the information in the system to increase in time without the involvement of intelligent being? The real progress in official science has stopped before many years because it was away from the main reason for the existence of the being in which we live. Nowadays many of the scientists are tasked to protect imposed speculative and philosophical theories in the name of the unclouded career, but not to seek the truth supported by facts . And try to foist the substitutes which are not supported by the facts obtained from observations and experiments. Such people considered their scientific career as a way to ensure social economic prosperity with the expense of ignoring scientific principles and truth. Yes, vacuum, as in the huge empty spaces between the atoms in the crystal lattice. Vacuum fluctuations occur on a scale much, much, muuuuch smaller than atoms. Looks like the ancients where right, the "ether" is real. So evolutionist do not know how life is emerged ot Earth but their beleieve is not based ot faith? I wait to give me a personal explanation how the first living organism emerged on Earth to figure out on what is based your believe system. On sciense ot on wishfull thinking. But it seems that you are not able to do this and ill never happen. Because you are just uneducated layman and do not understand what is said in the articles that give me as evidence. "if this were true, there would be NO RELIGION"
This sound fanatical. But we are talking about christian vs atheistic faith. Quote from the garbige cite that give me. "The theory specifically postulates that all of the earth's known biota are genealogically related, much in the same way that siblings or cousins are related to one another. " This is not true. I can give you many examples which refuting such a claim. Nope. You will not curse us with your own affliction. my job SAVED lives... hundreds... you? so you can't actually refute the studies with empirical evidence or science so you choose instead to pick a strawman argument and distract away from reality? your argument above is called" God of the gaps argument" and eventually you will recede into the annuals of history under "fanatical religious failures"
and yet you chose to intentionally cherry pick arguments without actually knowing the argument? perhaps you should read up a little on DNA and what it means? where is your validated studies which give empirical evidence that is proven by repetition and published in a reputable peer reviewed journal which refutes, undermines or proves your point? perhaps reading and comprehension are not your strong suit?